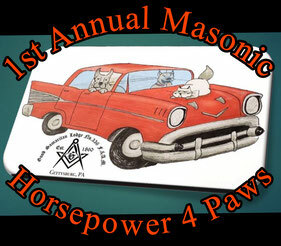 Good Samaritan Lodge No.336 is proud to host the 1st Annual "Horsepower 4 Paws" Car Show to raise money for the Adams County Animal Shelter, and our other various charities. It has come to our attention that there is a serious need within our community support some of our most vulnerable, and furry, members. Through this fundraising effort, and the generous donations received from both local businesses and private members of the community, we are striving to help meet that need. We take pride in not discriminating where we offer our assistance as we see so many needy causes right outside of our front door. In the past we have also helped organizations such Adams County WIC, the Adams Rescue Mission (ARM), individual persons and families going through financial hardships, and other various local churches and charitable causes. Where there is a need, we do our best to help. However, taking care of our furry friends is something no individual and no organization can do on its own! Please assist us in helping those in our community who need it the most! Please consider either showing your car, becoming a vendor at our event, or donating to this cause as your help is much needed and will always be welcomed.